This dissertation looks at the thematic and narrative tensions that emerge when certain prominent late eighteenth-century French epistolary novels deal with the issue of women's education and the possibility of its reform. The debate of the latter half of the century is firmly centered on Rousseau, who wrote both a best-selling epistolary novel dealing with the position of women in society (Julie, ou la Nouvelle HéloÃ¯se) and a controversial pedagogical treatise that suggests sweeping changes to male education but decisively anchors women within a limited domestic sphere (Émile). More specifically, I have examined the ways in which Rousseau's contradictory and problematic discussion of female pedagogy enacts narrative structures of tension and hesitation within both the treatise and the epistolary novel. Both texts, as well as the unfinished epistolary sequel Émile et Sophie, ou Les solitaires are destabilized by the fraught question of how to educate women. The contradictions engendered by attempts to maintain strict gender difference also plague Laclos' pedagogical treatises and his epistolary novel Les Liaisons dangereuses, which simultaneously offer revolution, reform, and rejection of female education. The Marquis de Sade subsequently approaches this topic with humor, choosing to imitate the excesses of Enlightenment discourse on female pedagogy, in turn creating a potentially instructive parody of his own. Finally, Isabelle de Charrière ponders the topic of women's education in a variety of non-fiction and literary works, which all reveal her cautious strategies of disguise and ambivalence when addressing such a hotly debated issue, especially from the point of view of a woman writer. 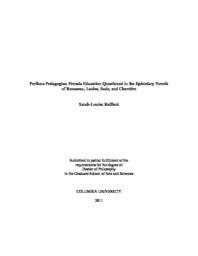 Examining both the theoretical and fictional works of Rousseau, Laclos, Sade, and Charrière, I prove that the convergence of epistolarity and female pedagogy was far from accidental, and that the tensions inherent in Enlightenment thought on gender are in fact mirrored in the narrative permutations and problematics of the epistolary novel.